The traditional function of the kitchen was room to prepare and cook food in. Today, we have seen a shift in the role of the kitchen becoming a combination of living, dining and a place for cooking. 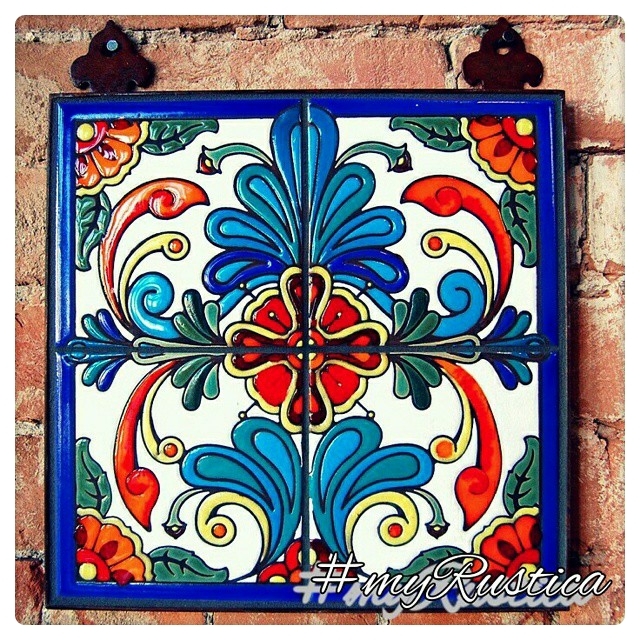 To create an interesting space, we believe our kitchen relief tiles from Mexico are a must. There are infinite ways you can decorate walls with rustica relief tiles. Whether it is small or spacious, you can use them on walls as the main theme or just as an explosion of color in the room you want to accent. Our kitchen relief tiles are mostly used for decorative backsplash but we can imagine them as countertop of your kitchen island and if you are lucky enough to have a fireplace, our ceramics can beautifully highlight it. Additionally, you can play it safe with plain tone pieces of furniture and add contrasts. On the contrary, if you are a fan of a pigment burst, choose multicolored and vivid design scheme which can be echoed in style by our ceramic relief tiles on the talavera countertop.The kitchen tiles go perfectly with varied styles. The only restriction is just your imagination and taste. Our custom-made, rustic appliances and furniture offers an extensive collection of decorative ceramic kitchen relief tiles. They are handcrafted the way the pattern is raised above ceramic tile background. Often used for a backsplash, wall statements but also for stair risers accents and swimming pool areas. You can buy them 4x4 and 6x6 inch tile sizes in over three hundred styles. Those relief ceramic tiles are also about one and a half inch thick made of semi-porcelain material which makes it incredibly easy to clean and very resistant. With a little bit of ingenuity, your kitchen can twin a charming French kitchenette with 17th-century lookalike French chairs, an iron, vintage chandelier (that you can also fin within a wide range of our products). The flooring is antique oak and the fireplace is original to the apartment. Designed by a countryside's enthusiast, your kitchen could feature a rustic style range hood custom-made by our professionals, and a wooden cookery island, mycustummade cooper sink and of course a final touch to it would be our picturesque Mexican relief tiles. Using handmade kitchen tiles embraces a fresh vision of hacienda-style that we specialize. If you prefer a minimalist and industrial flair in your home remodeling, you can use minimal decoration and just go with pops of shades featuring plain relief tiles chosen from our vast collection and that will infuse energy into a modest design. Using white appliances will bright space and pair with darker and brilliant tiles will open up the gallery area.